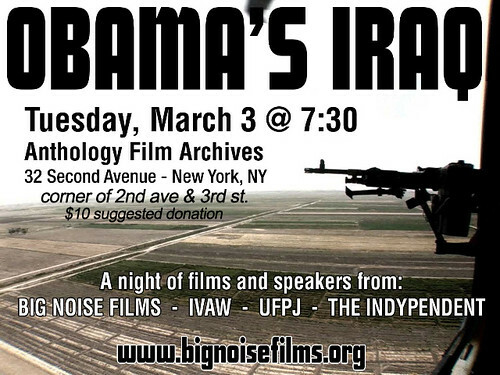 Obama’s Iraq is an evening of short films never before seen in America. Shot on the other side of the blast shields in Iraq’s walled cities, it covers a very different side of the war than is ever seen on American screens. It reports unembedded from war-torn Falluja, from the giant US prison at Umm Qasr, from the Mehdi Army stronghold inside Sadr City — from the places where mainstream corporate channels can not or will not go. The war in Iraq is not over. Hundreds of thousands of our troops are still on the ground, and Iraq is still occupied and in ruins. The neo-cons are out of power, but the battle for Iraq’s future is far from over. Iraq has faded from the headlines, but with over 1 million Iraqi dead, 4 million refugees, 4,000 dead American soldiers and a total cost of 1-4 trillion dollars, the war in Iraq remains the most important fact of American politics. The scraps of television coverage that still make the news don’t go far beyond US military press releases and Iraqi politicians interviewed inside the Green Zone. The evening will feature three 20-minute films and a discussion lead by: Alaa Majeed, Richard Rowley, and David Enders (Big Noise Films); Perry O’Brian (Iraq Vets Against the War), Judith LeBlanc (United for Peace and Justice), and Arun Gupta (The Indypendent). Obama’s Iraq asks the questions — what kind of occupation has Obama inherited, and how can we end the war in Iraq? For more information, email: <noise@bignoisefilms.org>.